something better to do while waiting to arrive in their destination. If you’re going to buy this entertainment system for your car, you have two excellent options to choose from when you shop at Elinz Electronics. HD706WPCL and HD70DSWPCL are amongst Elinz’ bestsellers and they can definitely make travelling more fun and exciting. But which of the two should you choose? Here are their similarities and differences. adjustable poles to make installation much easier. 2. Sony laser lens. The DVD players come with laser lenses made by Sony, which is well-known across the globe for creating a wide range of entertainment devices with cutting edge technology. 3. Extra AV inputs. Connecting the devices to other portable devices, screens, and even gaming consoles won’t be a huge problem because the HD706WPCL and HD70DSWPCL have extra AV inputs. the interior of your vehicle organised and cable-free. 5. Multimedia player. Aside from DVDs, HD706WPCL and HD70DSWPCL can also play other media files such as MP3s and WMAs, as well as support 32-bit games. They also have built-in FM transmitter with seven channels available. 6. Available in 3 colours. These headrest DVD players come in three colours: beige, black, and grey. So no matter what colour your car’s interior is, you can be sure to find the one that matches your vehicle’s interior. Now, let’s take a look at what makes the HD706WPCL and HD70DSWPCL different from each other. 1. HD screen. Unlike the HD706WPCL, the HD70DSWPCL has high definition screen. Its high resolution LCD screen displays images with vibrant colours and with real-life detail. 2. Price. When it comes to price, HD706WPCL is the winner as it is cheaper than the HD70DSWPCL. The former is sold at $260 while the latter has a tag price of $289. 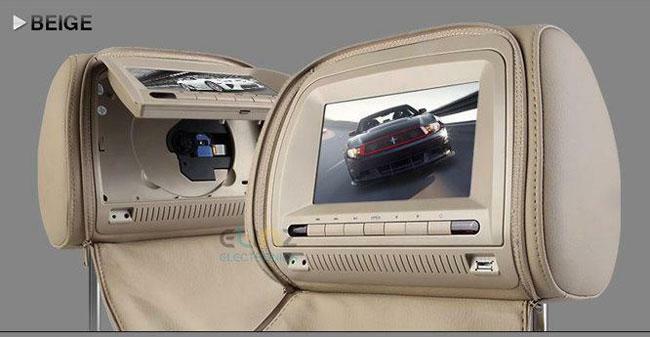 If you want an Elinz car headrest DVD player capable of producing images with better quality, then you should go for HD70DSWPCL because it has an HD, high resolution screen. But if you want something that costs less, then the HD706WPCL would make an excellent choice. If you want to learn more about these DVD players, be sure to check out Elinz Electronics.